Shri Pratap Shastraghar, located inside the Royal Lukshmi Villas Palace was erected on 18th March 1941 by Maharaja Pratapsinhrao Gaekwad. The shastra-ghar contains many famous and rare things. Some of them includes Swords of Paternal Uncle of Muhammad Paigambar Saheb which is 1300 years old, nav-durga sword etc. It includes many rare swords, weapons etc from around the world. Maharaja Pratapsinhrao Gaekwad and Prof. Manikrao both made a good collection on it. The 1300 year old abbasi alemani sword, which is of Muhammad Paigambar Saheb’s Paternal uncle, which was used in war of Karbala, was also buy’ed paying a whopping amount. Also the shastra-ghar includes elephant teeth which has carved design is included. The shastra-ghar also has catalog for the things it has. When the shastra-ghar was made, Maharaja Pratapsinhrao Gaekwad built a committee with Prof. Manikrao and selected the best weapons to showcase here. 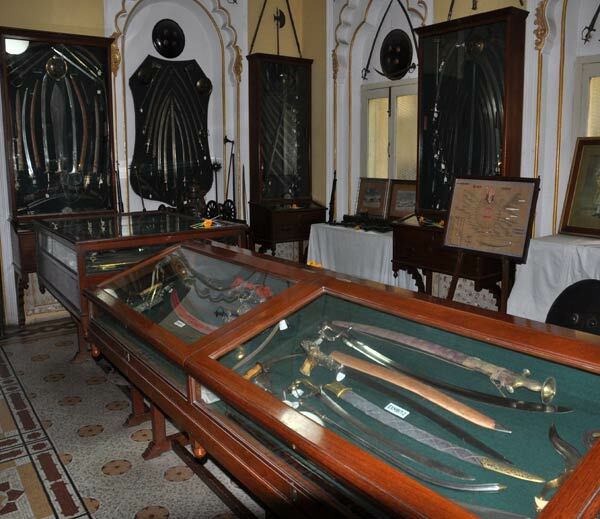 Shri Pratap Shastraghar consists of 500-750 years old swords and weapons. The Panchkula talvar of Guru Gobindsinhji, consisting of 5 weapons in 1 swords, the sword of Shivaji maharaj, Aurangzeb’s sword, naagin talvar etc. Guns from old times, used during world war and revolvers can also be found ! The sword with diamond and pearls, that Maharaja Sayajirao Gaekwad used during their reign is also put up on display here. Please Note: Photography is Prohibited inside Shri Pratap Shastra-ghar.